UPDATE 1: NOAA has pushed forward the start date of the storm watch. The article below has been updated. Charged Particles from Sun heading towards Earth. 48 hours: 5 Kp possible. When does the Aurora storm watch begin? The National Oceanic and Atmospheric Administration (NOAA) Space Weather Prediction Center has issued a 48 hour magnetic storm watch indicating a Coronal Mass Ejection (CME) or a high speed solar wind stream emanating from the Sun may be heading towards Earth. These fast moving charged particles can cause a Northern Lights display. The watch begins at the time indicated above. It should be noted that the beginning of the storm watch does not necessarily predict the arrival time of the aurora-causing particles, rather it indicates that, within that 48 hour period, increased activity is expected. Real-time Aurora Borealis forecasts can be obtained at the Aurora Borealis Forecast page at Soft Serve News. Big Auroras often happen without warning. Stronger CMEs can sometimes cause trouble for satellites and create problems with electrical grids by inducing currents as the CME cloud interacts with the magnetic field that surrounds the earth. It is this disturbance of the Earth's magnetic field which is the cause of the Northern Lights. NOAA indicates that weak power grid fluctuations may occur and some minor impacts on satellite operations are possible. The Northern Lights, also known as the Aurora Borealis, can range from a faint green glow on the northern horizon to a multicolored, full-sky display which can be one of the most beautiful and awe-inspiring scenes in nature. WILL YOU BE ABLE TO SEE THE AURORA? Step 1 -- Know your Location's "KP number." The KP number is the Geomagnetic Activity Level. The stronger the Aurora, the larger the KP number and the further south it can be seen. Find the KP number for your location on the one of the maps below. On the night you wish to view, periodically check the real-time Aurora Borealis Forecast. 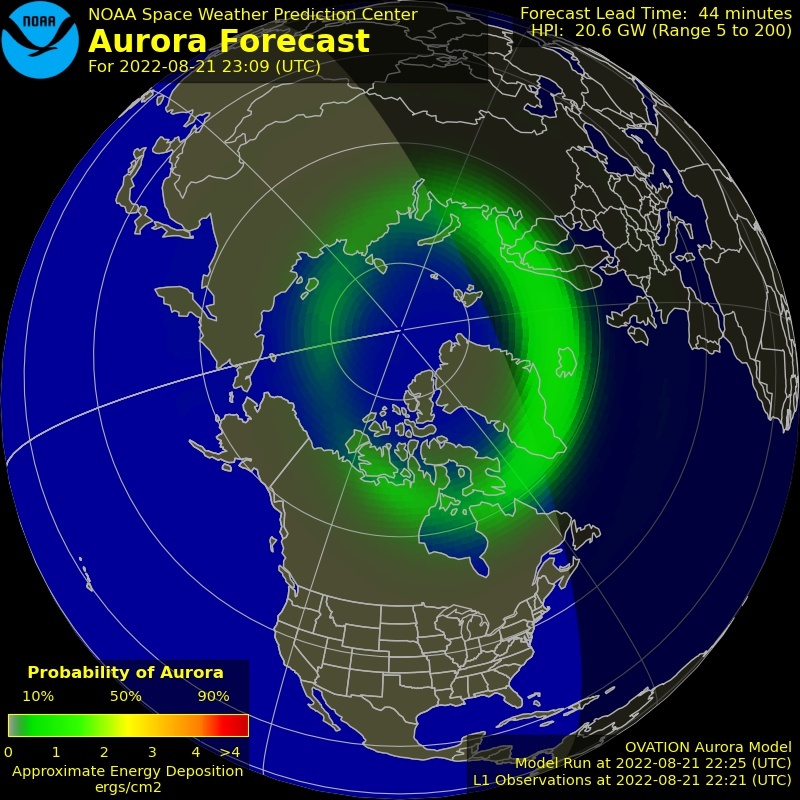 This will give you the KP number prediction for the Aurora for the next hour or so. If that number is greater or equal to the number on the map for your location, you're in luck. Even if the predicted number is one point too low, it still might be worth a look. Step 2 -- Check the Ovation map. It is a good idea to get confirmation of activity with NOAA's Ovation map. The Kp number gives nice info on how large the storm is, but the Ovation map does a better job of telling you if you can actually see it. It gives a 30 to 40 minute forecast of the size of the aurora along with a color-coded probability of seeing the aurora over various spots on the Earth. Look for light yellow, orange or, better yet, RED on the Ovation map instead of the usual dark green. Step 3 -- Check the Weather. Auroras happen in the upper atmosphere, so if there are clouds blocking your view of the stars, you won't be able to see the Aurora. Step 4 -- Shop for a Dark Spot. Get away from those city lights. Darkness is best for viewing the Aurora. The fewer competing light sources, the better. But it is also very important to remember the widest part of the Aurora is when the sun is on the opposite side of the earth. So late, nighttime (or early morning) dark tends to be best. Experienced Northern Lights hunters are familiar with disappointment. Predictions of when the CME cloud or a high speed solar wind stream hits the earth are not always accurate. Sometimes CME events produce much smaller displays than expected, or even none at all. Also, it is possible the main auroral event happens during the day and therefore can only be enjoyed by people on the other side of the world where it's dark. 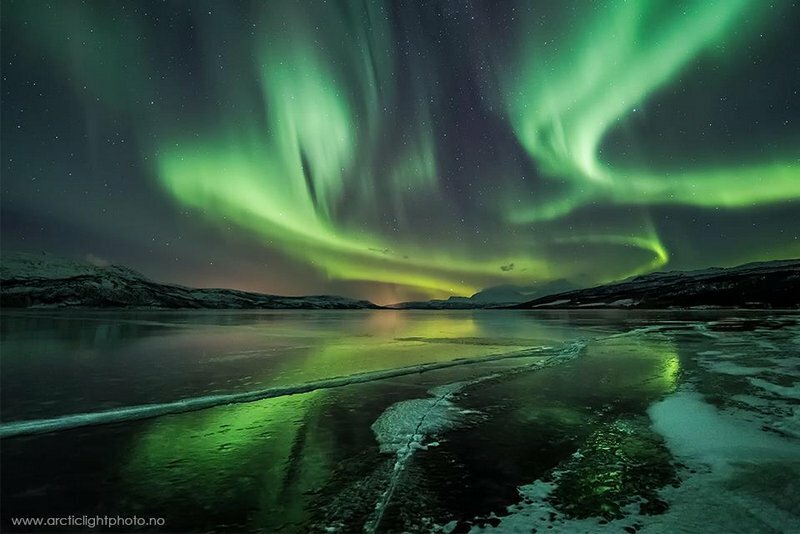 Even with these uncertainties, seeing the grandeur of a powerful Aurora Borealis display may be a once in a lifetime event, so for some it's worth the gamble to try.